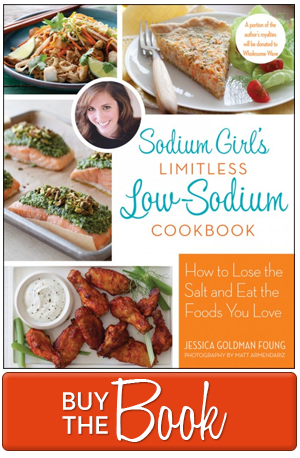 I’ve said it before and I’ll say it again: low-sodium diets have a major branding problem. Many people — with heart disease, kidney disease, menieres disease, and other health issues — can stand to benefit from eating less salt and sodium. And yet no one takes the bait. Because the bait still sounds pretty boring and bland and more like a prescription than something you want to eat. Here’s the thing, though: A low-sodium diet is food. FOOD! And while yes, it can be boring, any kind of food can be boring. So it’s up to you to make it exciting. To use spices and unusual pairings to surprise your palate. To take risks and try something new, to expand those culinary chops and horizons. And to bring pizzaz to what’s on your plate. But what about all the limitations, you ask? Well, let me answer your question with another question. What about all those people happily living the gluten-free or Paleo or vegan or Whole 30 lifestyles? Yeah, those people proudly posting pictures of their zucchini noodles and cauliflower pizza crusts and nut “cheeses.” Those folks who have just as many (if not more) restrictions as a low-sodium dieters. What about them? The difference isn’t more ease or access to more ingredients. The difference is ownership and pride. And perhaps a snazzier name (and yes, better branding). Whether your friend is Paleo or on a cleanse, I bet you they own it. They’re proud of themselves for taking care of their bodies. Instead of seeing the diet or eating plan as a loss, they see it as a gain. And guess what? As a result, everyone else does, too. Which is why you see so much Paleo and gluten-free and vegetarian and vegan and whatever-else-new-thing diet on the cover of magazines. Or with a whole grocery store aisle of their own. Confidence is infectious — whether you are wearing a new pair of pants or serving your friends cauliflower “steaks” for dinner. Which brings me to cupcakes. 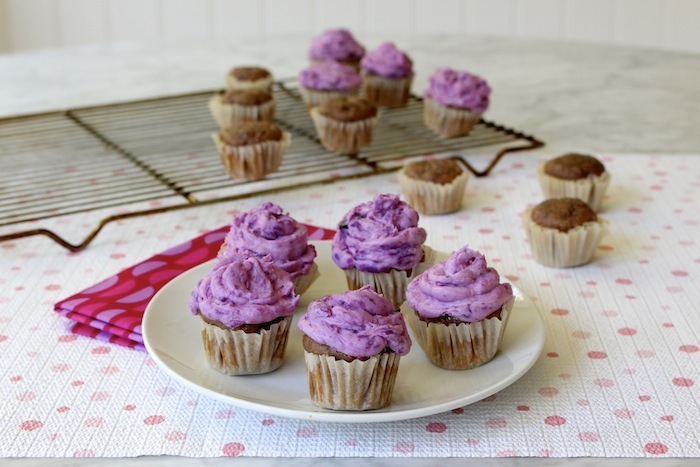 These Mini “Monster” Purple Sweet Potato Cupcakes, to be specific. They are my edible metaphor for how a low-sodium diet SHOULD be branded. Colorful, fun, flavorful, and most importantly, full of real food. And just look at them. They deserve to be in the Pinterest hall of fame. In its simplest form, a low-sodium diet is simply on that focuses on eating whole foods and ditching the prepared, packaged stuff. It’s about making your favorite things, from scratch, and being in full control of the ingredients and the flavor. All while finding ways to keep things convenient and tasty. And I’m pretty sure, that’s something anyone can get behind. As for these cupcakes, I made them as part of my friend’s October Unprocessed challenge. It’s a month long pledge to ditch the junk for real food. Or in my case, make a dessert without a single processed ingredient. Which means no store bought cake mix or frosting, but lots of mashed banana, sweet potato, yogurt, applesauce, and a few other pieces of real magic and decadence. Which means (part two) that these cupcakes are filled with so much good stuff that I actually let my daughter (and myself) eat them for breakfast. Even though October Unprocessed officially ends in just a few days, I think it is an awesome way to kick start (or restart) your low-so lifestyle, any time of year (note: definitely look at past years, too, for inspiration). Plus, calling your new food plan “unprocessed” or “clean eating” can feel cooler and trendier than low-sodium. So rebrand your food, if you want. Call it whatever gives you confidence. And then take it a step further and convince a few other friends or coworkers to tag along, and create a pre-holiday, November Unprocessed challenge of your own. Because, basically, whether you are Paleo or low-so or “eating clean,” cooking out of the box is far from a bad thing. It forces you to try new things, eat better, and most likely, cook better, too. So as Halloween approaches and October Unprocessed comes to a close, I give you these cupcakes. As both a sweet treat and a reminder of the potential that lies ahead in your #lowsogood life. Line a mini muffin pan with paper liners. In a medium bowl, mix the dry ingredients (flour, baking powder, and cinnamon) together. Then, add the egg, milk, sugar, applesauce (or zucchini), 1 cup of mashed sweet potatoes, banana, and vanilla. Mix again until everything is combined and the batter is smooth. Fill each muffin tin ¾ of the way full with batter. Shake the pan a little to settle the batter. Then place the muffin pan into the oven and bake for 12 to 15 minutes, or until a knife inserted into the middle comes out clean. When done, let the muffin pan rest on the counter to cool. Meanwhile, in a medium bowl, mix the second cup of mashed purple sweet potatoes with ½ cup of yogurt and powdered sugar. 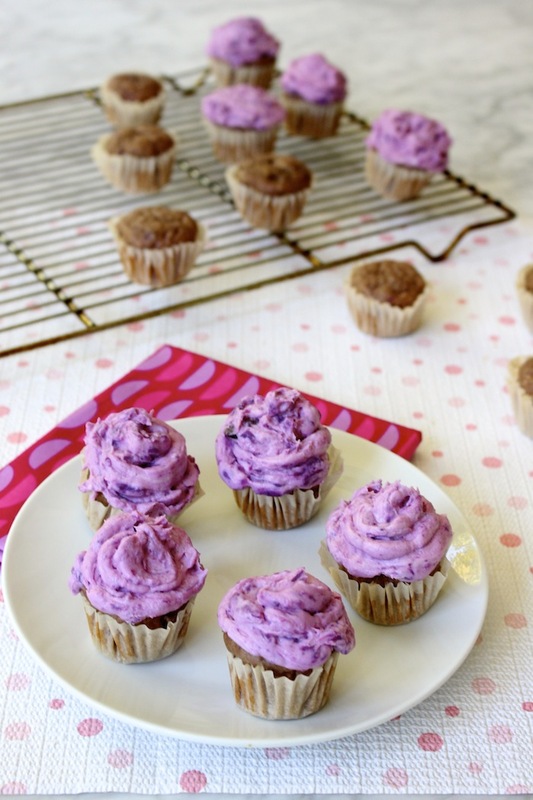 Stir until the “frosting” is smooth and it takes on a uniform purple hue — although a swirly, marbled look is nice, too! If it feels too firm, continue to mix (which will make it “runnier”) or add a little more yogurt until you get your perfect frosting texture. Then, use a spoon or spatula to transfer the frosting into a plastic bag or a piping bag, if you own them. If using a plastic bag, push as much of the frosting towards one of the lower corners and twist at the top, removing as much air as possible from the bag. Then snip off the end. When muffins are cool, squeeze, swirl, and frost the tops. I agree with you that the low-sodium diet has a rebranding problem. When I first heard of it, my first reaction was “blech.” I didn’t want to eat tasteless food. But when I learned more about it, the more I realized how much it makes sense and how it’s not complicated at all. Thank you for this enlightening post, and those pretty, pretty cupcakes. Sodium Girl, you couldn’t be more correct. People do have a hard time wrapping their mind around the thought of eating low-sodium foods . The first thought is that it’s bland, tasteless and yes, boring. I ordered salt-free popcorn at the movie theatre and a friend asked me “what do you do with that?” Actually, it tasted rather good. As we put less salt in our food, we can actually taste the food itself, especially when it is unprocessed food. 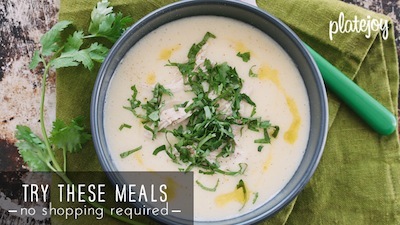 We need to see that low sodium foods can be beautiful, delicious meals that we look forward to eating. Thank you! I’ve been looking everywhere for some good low sodium recipes. My daughter is six and has a problem with her heart. My family needs some taste!